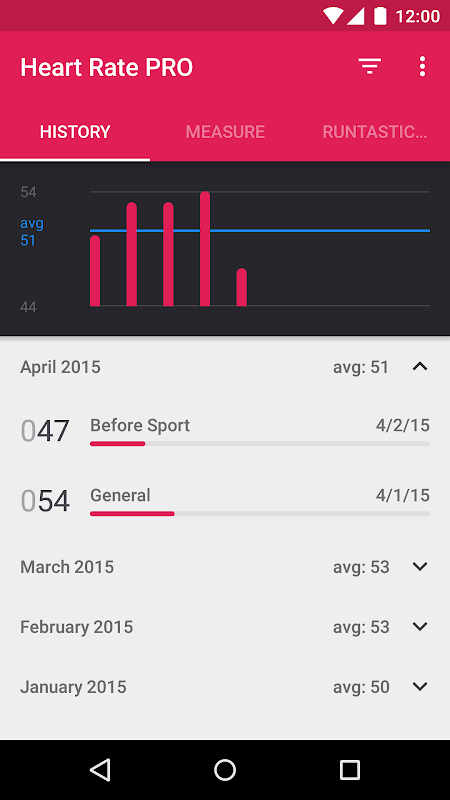 Turn your phone into a quick and accurate personal Heart Rate Monitor (HRM). Runtastic Heart Rate Monitor PRO can quickly and easily measure your heart rate with just your phone, no chest straps or external hardware is needed! Simply place the tip of your finger over your phone's camera to get your measurement. Taking your pulse is an easy way to determine your physical condition. Measure your heart rate after a training session to find out how your cardiovascular system is doing under stress, or take a heart rate measurement when youre relaxed to measure your resting heart rate. 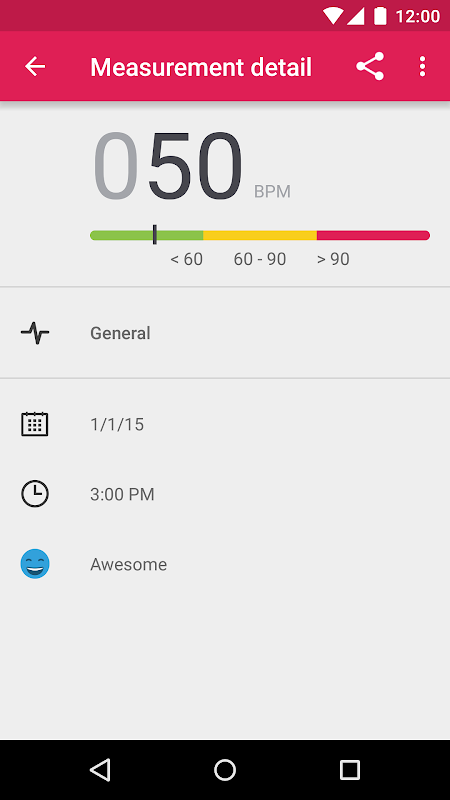 Use Runtastic Heart Rate Monitor PRO shows you how fast your heart is beating at any given moment. Go PRO today! PRO FEATURES: * Unlimited measurements: Determine your heart rate anytime, anywhere & as often as you like * Use filters: Filter your measurements according to type (resting heart rate, pre & post-workout heart rate, maximum heart rate) * Graphs to monitor your progress: Monitor how your resting heart rate changes over time * Reminder: Receive automatic notifications for regular heart rate measurements * No ads APP FEATURES & BENEFITS: * Measure your heart rate with your phone's camera * Graphs illustrate your measurement history * Different measuring types: Resting heart rate, pre & post-workout heart rate, maximum heart rate * Upload your results to Runtastic.com: Compare and analyse your measurements by day, week or year * Share your heart rate measurements on social networks like Facebook, Google+ & Twitter or via email EASY TO USE * Place your index finger against the back camera lens and flashlight * Do not press too hard, otherwise blood circulation will be altered and the results could be affected * When using a smartphone or tablet without a LED flashlight, be sure to take the measurement in a well-lit area (bright daylight works best) * Remain calm and try not to move too much during the measurement, as this can compromise measurement accuracy * Do not measure with cold fingers when the blood circulation is poor EFFICIENT ANALYSIS Your resting heart rate varies depending on your age and training level. A very fit and athletic person has a lower resting heart rate than someone whos inactive. Eager to know if your fitness level has improved? 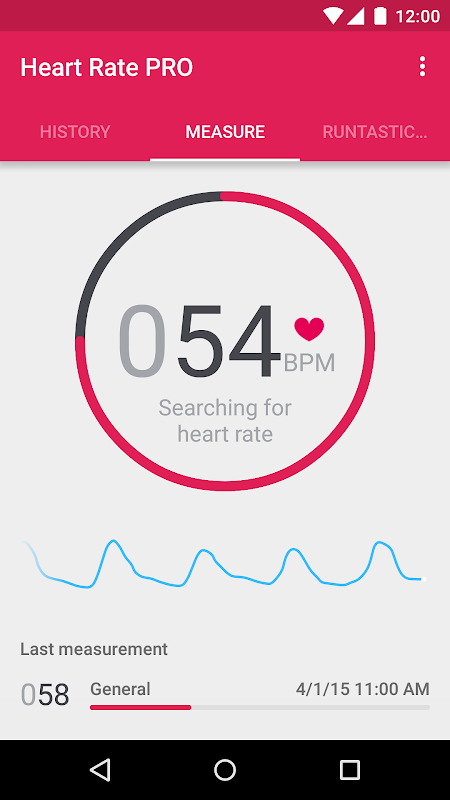 Measure your heart rate on a regular basis and monitor the progress of your resting heart rate. Download the Runtastic Heart Rate App Monitor PRO app today, check your heart rate regularly and show your friends how cool & calm you remain even when in a seemingly stressful situation! WARNING: This is not a medical product. 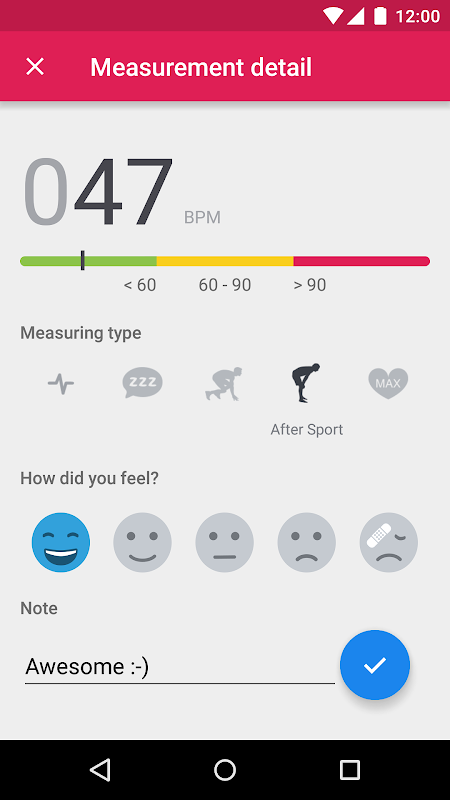  Is Runtastic Heart Rate PRO yours? Claim it!